It’s March 1975. In the three months since the last blog entry, the most important news in the UK has been the election of Margaret Thatcher as the Leader of the Conservative Party. Though in opposition for now, this is only the beginning for Thatcher. In the coming four years, she will prepare, she will grow stronger and, when the time is right, she will emerge and take her rightful place as the supreme power in British politics. And in Doctor Who we’ve got this. My first inclination when I got to 1975 on this blog was to avoid Genesis of the Daleks and go for something less obvious, (probably Planet of Evil, which I’ve always admired as a sci-fi retelling of M.R. James’s Oh Whistle and I’ll Come to You My Lad). But Genesis defies avoidance tactics. To an extent, it’s the hardest Doctor Who story of all to avoid – on top of the inevitable VHS and DVD releases, the endless satellite re-runs, the LP, a cassette, and an audiobook, it’s been shown five times on BBC One and Two. Many hundreds of thousands of people who might never have seen another Tom Baker episode have seen this. It even casts a shadow over the 21st Century series, called out by Russell T Davies as the opening shot in the last great Time War. In various polls, it’s invariably in the top five episodes of all time. In short, this is the biggest classic series story. Genesis exerts a lasting fascination. The Discontinuity Guide claims Davros is the ultimate Doctor Who villain. But it’s more than that. Genesis feels almost like the ultimate Doctor Who story, one that goes back to the very roots of the series, and seems to subconsciously synthesise almost every major trend we’ve seen over the last 12 years. It opens almost uncannily like The War Games – a battlefield, shrouded in mist, with an unsettling mix of weapons from every point in Earth’s history. But this isn’t Earth – it’s an alien world. And then a Time Lord arrives. How much of this is incidental, and how much might have been deliberate on the part of David Maloney (director of this and The War Games) is a matter for debate. But if Barry Letts and Philip Hinchcliffe had, indeed, decided to go for a Patrick Troughton era cosmic horror vibe – and the idea of commissioning Gerry Davis to write a Cyberman story on a space station suggests that they must have at least subconsciously been thinking along those lines – then the opening of Genesis might be more than coincidence. If the opening references one Troughton epic, then they must also have been thinking of the other. The last time we saw Skaro was in The Evil of the Daleks, another story that questioned the nature of the Daleks themselves. There, David Whitaker was taking the Doctor and the Daleks back full circle, for what was planned as their final confrontation. Genesis has the same sense of occasion. The opening conversation with the Time Lord is positioned as one last mission for the Doctor. The appearance of the Time Lord sets up a story that’s about impossible choices. When the Time Lord reminds the Doctor of “the freedom we allow you” the threat is obvious – he doesn’t really have a choice: he either does this, or he finds himself on trial again. The difference between the Jon Pertwee and Tom Baker episodes is sometimes overstated – the beginning of Death to the Daleks is at least as eerie as this. But the overall tone of overwhelming horror; the way the camera dwells on corpses; the realistic poison gas weapons and machine guns, and the relentlessly horrifying tone of the opening episode are more disturbing than anything in the Pertwee years. By its end, when Davros announces “we can begin” and the theme music crashes in, the audience has already been primed for something extraordinary. And for all it’s easy to criticise the giant clams, the ridiculousness of a tunnel between the Kaled and Thal domes, the cheat cliffhanger to Part Two, the fact that the most famous moments (the confrontation between the Doctor and Davros and the Doctor’s prevarication outside the Dalek nursery) are confined to the last two episodes. For all that, there is a queasy power to this story – the mercilessly brutal tone that Nation’s going to develop in Survivors and Blake’s 7 – that tends to crush any doubts that we’re watching an epochal story. At this point, Tom Baker has also nailed how he wants to play the role: with a flippancy that seems permanently on the edge of erupting into anger, a tetchy, warning note in his voice that once each story boils over – here, it’s in the scene where Davros demands he tell the secret of future Dalek defeats and the Doctor bellows with rage, “No I will not!” He’s more dangerous than the third Doctor, someone to be wary of. While Pertwee’s Doctor frequently blew himself out in a rage against some hapless bureaucrat, when Tom Baker’s Doctor raises his voice, it’s frightening. He’s mercurial: eloquent and shrewd, volatile in temperament. Against this permanently edgy Doctor, you need a villain who’s equally dangerous. Even before they meet, the Doctor and Davros are being set up as ideologically opposed enemies. Davros has discounted the idea of life on other planets: a pathologically narrow racialist ideology that’s going to be bred into his creations. Nyder claims Davros is never wrong, to which the Doctor testily replies that even he is occasionally wrong – Davros’s absolute certainty and conviction already being contrasted with the Doctor’s inquiring mind and self-reflection, which also neatly sets up the later scenes where the Doctor questions the morality of his own mission. That’s the unresolved conflict between the two of them – through his Daleks, Davros wants to be a god. Everything is an absolute: like Hitler, when he believes his people have proved themselves unworthy of his leadership, Davros simply condemns all of them to die. Meanwhile, the Doctor’s more worried about becoming a murderer, and can see some chance for good even in the most evil creatures. Michael Wisher’s performance is extraordinary – a reflection of Tom Baker’s sudden switches from still contemplation to boiling anger. But equally praiseworthy is Maloney’s direction, including an astonishing moment in Part Two which references Michelangelo’s Creation of Adam as Davros’s finger reaches out to activate the Dalek’s self-control circuit for the first time. So, you have an actor well on the way to becoming the definitive Doctor, pitted against a half-man, half-Dalek psychopath locked in a room together, and creating some of the most scintillating and memorable scenes in the entire series. You’ve got the Daleks as a sinister background force, gradually gaining in numbers and strength as the serial continues, until the point when they finally kill their creator and take control of the story. You’ve got some of the most dynamic direction in the show. What about the Time War? Why did Russell T Davies pick out Genesis of the Daleks as the beginning of the end for the classic Doctor Who universe? What is it that makes the Time Lords so afraid of the Daleks? We’ve previously seen that the Daleks are a force of change. Davros calls them the final mutational form, the ultimate creature. Their first story was originally titled The Mutants – their very nature is in mutation and change. They certainly changed the Doctor. At their most evil, they wanted to change what it meant to be human. It must therefore be deliberate that at each stage, the Doctor’s mission is couched in the terms of stopping the development of the Daleks. Not killing them, but stopping them from developing, evolving, changing. In comparison, as we saw in The War Games, the Time Lords are a force of conservatism: it’s why the Doctor left Gallifrey. They’re the lords of time, not its subjects – and change by its nature only happens to things that are subject to time. The Time Lords have placed themselves above the law, timeless and therefore unchanging, and they will stop any development that might threaten their own power. I think that is the heart of the Time War – a conflict between a race that’s born out of chaos and destruction, tearing everything down and starting again, and one that values ordered calm above all – that, as we’ll see in the next blog entry, is by its very nature unable to change in any measure. At the end of the Time War, the Time Lords’ plan consists of bringing about the end of time itself, freezing the entire universe in an unchanging nothingness. 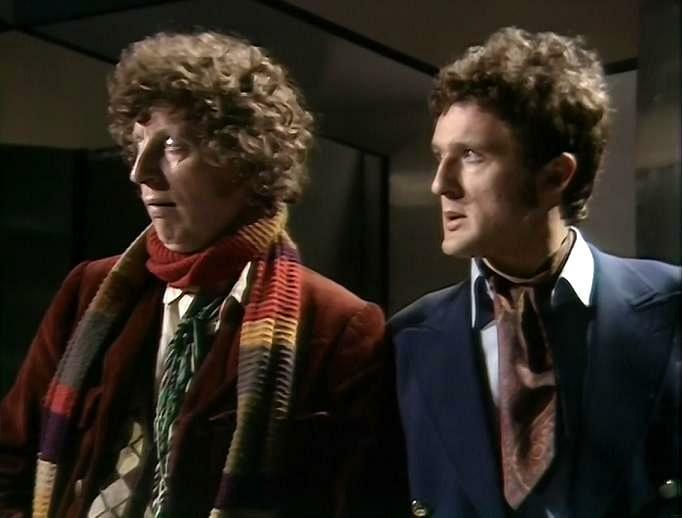 This conflict between order and chaos strangely resonates across Tom Baker’s tenure. The next producer will propose the entire universe is structured round the struggle between these two extremes, and the last plots Tom Baker’s entire final season around the idea of time’s arrow leading inevitably to disorder and the end of the universe. Ultimately, the Doctor has already recognised that he isn’t infallible. So it follows that he rejects both the Dalek solution of extermination, and the Time Lords’ power to rewrite time and cheat the rules. The power of this scene is so indelible that Russell T Davies wrote the tenth Doctor’s fall, in the “Time Lord victorious” scenes of The Waters of Mars, around it. The Doctor’s own nature, as a free agent, a catalyst for change, a mercurial element, shows it’s possible to escape from your own history, that just because you’ve come from a civilisation that is frozen in inaction doesn’t mean you have to accept that. The Doctor dares to change history every time he steps out of the doors of the TARDIS, and he dares to hope that the universe isn’t built around black and white choices, that even the Daleks, the most evil creatures ever invented, might have some capacity for good. But, unlike Davros or the Time Lords, he never pretends to have all of the answers. That’s the lasting power of Genesis: the questions it raises about the nature of the Daleks, the Time Lords, the Doctor and the series are left tantalisingly hanging, to play on the imagination a long time after the story ends. It’s one of the reasons why people are still writing about it 38 years later. Next Time: “The Time Lord has thirteen lives and the Master had used all of his. But rules never meant much to him…” The prodigal son returns home in triumph in The Deadly Assassin.